I sometimes wonder if Malcolm McLean (the pioneer of modern day shipping containers) imagined back in 1956 that one day people would be living inside cargo boxes – comfortably. Shipping container homes probably seemed like a crazy idea a few years back but is now becoming a hip and practical way to live. Buying a traditional home is becoming more and more expensive every year, and the barriers to entry are becoming bigger. Even for those that already ‘own a place of their own’ – just finding enough money to pay the mortgage can be stressful. This problem has motivated people to find a solution. They are looking for a way to create living space that is affordable and free themselves from the chains of traditional home ownership. Shipping container homes have emerged as a solution. Often the most interesting part about container homes – are the stories of the people living inside them. 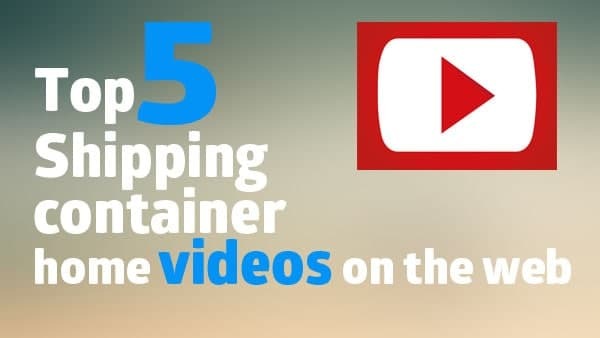 Let me share with you 5 of the most viewed shipping container home videos on YouTube. See the homes – and the people behind them. One US couple considered using prefab housing for their retreat home in Redwood Park but found this option to be too wide to access their site. Discovering that shipping containers are 8ft wide helped steer them towards a cargo box alternative – especially since they were able to connect the containers for more room width once on site. A total of 4 x 20ft containers with an age of about 20 years were used for the build. Thanks to large strategically placed windows the property benefits from beams of natural light throughout. When standing inside the first floor it’s not so obvious you’re inside a shipping container – but the upper level has retained the rawness of appearance that shipping containers ooze. Seattle-based architects Robert Humble and Joe Egan created a mobile shipping container home which is utility bill free. The container produces its own solar power and collects its own water. One great thing about shipping containers is that they can be joined together to create large amounts of space. In this case 2 containers were connected after one of the side walls had been removed. Inside the home is a sleeping area, wet room and kitchenette. If the owner wants to up sticks then the containers can be easily disassembled and moved to another location. And with no electric or water bills to worry about it’s no wonder that this is the 4th most viewed shipping container home video online. Bill Glennon, the builder of this extraordinary home gives a great piece to camera about his build plans. The video backdrop shows some of already assembled containers in the background as he explains that the build will use 31 shipping containers. Once finished the home shall feature 2 towers, a windmill on one tower and elevator shaft on the other. With a total of 4 stories the finished container home will be powered by solar energy with a backup propane boiler and wood burning stove. He hopes to be able to heat the home for less the $1,000 per year. Sounds good to me! How many 6 ½ minute slides shows can keep you entertained the whole way through? Packed with high quality images of global conversion projects that inspire – this video is a must see for container home eye candy. A Californian mother was staying with a friend temporarily and needed to find a place of her own for her family. She didn’t want to be tied down with a big mortgage or high rent bills so when a shipping container was given for free a plan was borne. Using a loan of $4,000 she self-converted the container herself. 1 month later it was ready to move in to. Having little money available meant she had to be creative with the build. Simple insulation of the container was achieved using bubble wrap, styrofoam and plywood. This helped protect her home against condensation without having to spend too much. You have to really admire the determination it must have taken to get this project off the ground with the minimal resources she had. Do you have a shipping container conversion idea of your own? Learn more about how we can help.